Aid Box Community (ABC) has launched a £25,000 appeal towards new premises. This follows news that its service providing help for refugees and asylum seekers in Bristol can no longer be provided from its Hub in Waverley Road, Redland, as the building is not fit for purpose. The organisation has set up a crowdfunder for money to set up in alternative premises and warns that without help it will not be able to offer a service. 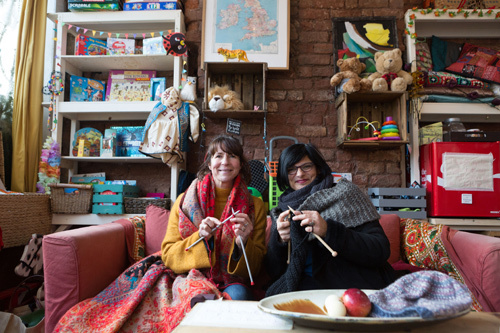 Founder Imogen McIntosh said: “While we always knew we could not stay there for good, we thought we have more time to raise the money needed to move. “Our premises is a vital, life-giving place for people to come and be welcomed with humanity and dignity and we work very closely with the other refugee organisations in Bristol who refer people to us regularly. The organisation runs a free shop from the Hub on Waverley Road. In two years it has supported more than 400 families and individuals in building their home in Bristol. Aid Box Community was given charity status in April 2017 after it was born from a Bristol-based, grassroots movement taking convoys of aid and supplies from local people to the refugee camps in Northern France during 2015-16. A network of volunteers have recycled tons of donations that would have otherwise been sent to landfill. Imogen said: “Today our situation is simple – with no home we have no service. Rent for a new place for the first year will cost around £25K. That is a lot of money – it’s money we don’t currently have. "We know that we can do this with your help - but time is against us. We now have to achieve our target to be able to move. "The longer we are without a premises, the longer the people we support will go without.